Savvy shoppers are always on the lookout for tools that get the job done and don't break the bank. This week DeWalt's smallest grinder, the DWE4011, made its way onto my workbench. It looks like the other DeWalt grinders, but it sell at a price much lower than one would expect. Let's take a look, if the DWE4011 is an incredible value, or if it's a lemon you should keep out of your toolbox. 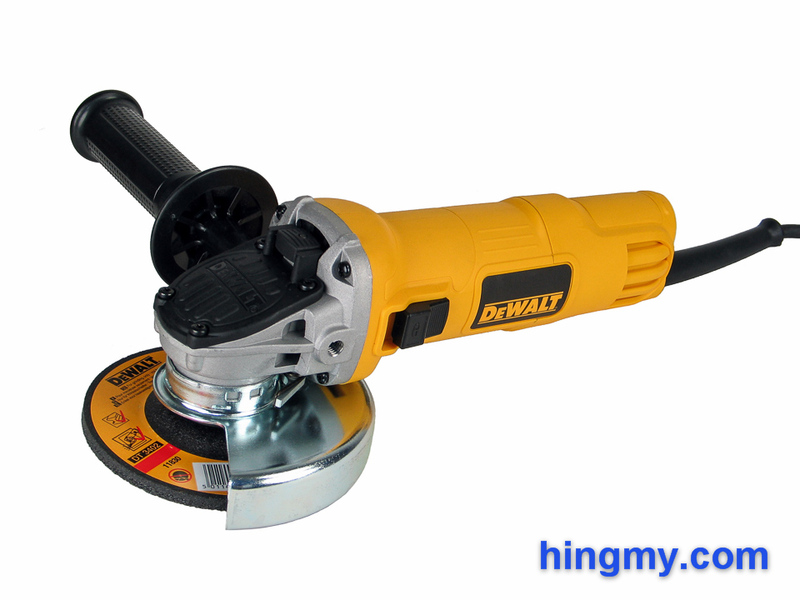 The DWE4011 is an entry level 4 1/2" grinder from DeWalt. It follows the traditional design of marrying a metal gear casing to a plastic motor housing. The 7 amp motor is one of the weaker ones in the field, but the grinder's rotation speed of 12,000 rpm is one of the best. Unfortunately the engineers were unable to make this grinder a quiet tool. The noise level during operation can be ear splitting. Hearing protection is mandatory safety equipment when using the DWE4011. Build quality is excellent in typical DeWalt fashion. The cast magnesium gear housing promises a long tool live. The plastic cover appears to be out of place, but does little to affect the durability of the grinder. The hard plastic body both protects the motor and acts as a grip. Dropping the grinder will likely result in little more than a few scratches. The DWE4011's under-powered motor keeps it out of a professional's toolbox. The latching power switch of the DWE4011 is located on the left side of the body. Once activated the motor comes on at full power. Startup torque is significant, due to the absence of a soft start feature. Unfortunately the motor turns on when the grinder is plugged in while the power switch is in the On position. The 6 ft power cord is one of the shortest I have ever seen on a grinder. The forward handle screws into position on either side of the gear housing. Once tightened down it becomes an unmoving part of the grinder. The black plastic grip is comfortable to hold onto and offers the user great control over the grinder. The spark guard of the DWE4011 spins freely around the arbor. A spring loaded lever locks it into place in one of 8 different positions. Unlocking the guard only takes a push of the lever. 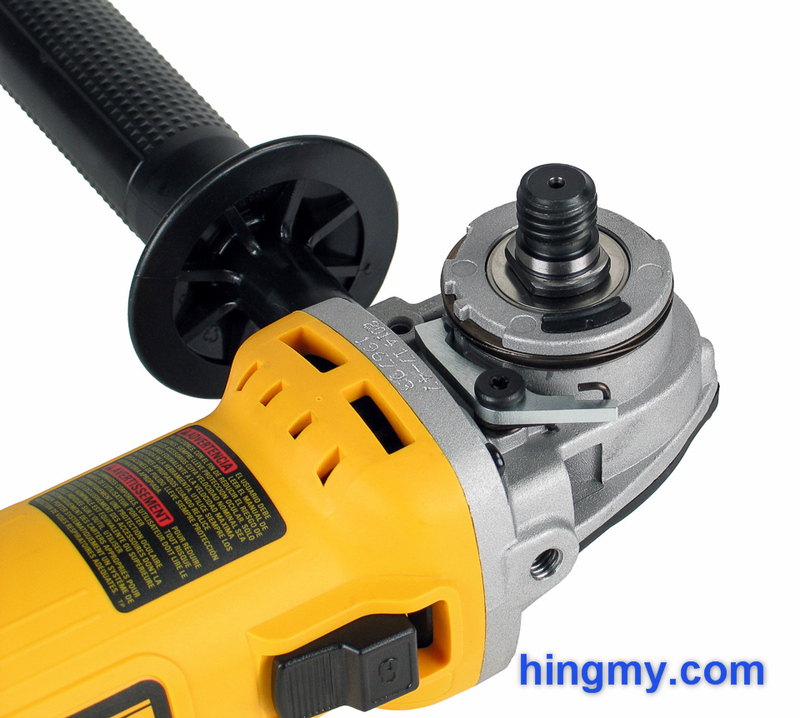 To remove the guard completely, the grinding disk and collet nuts must be removed first. This system works well, but it was not engineered for durability. If you use your grinder predominantly in one configuration, all the extra parts of this mechanism become a liability in the long term. The fit between the guard and the arbor is already a loose one. A simple compression clamp is often a better choice than a complex mechanism. In a light to medium duty environment, however, the DWE4011's fast-adjust guard can be a real asset. Grinding disk changes work a little differently on the DWE4011. Instead of a blade wrench, the kit includes a large Allen key. To loosen the collet nut the key must be inserted into one of two hex sockets on the nut. This creates a lever, which is used to loosen the nut. A large plastic spindle lock button on the top of the gear housing locks the spindle in place. It is in the ideal spot for the thumb of the hand that holds the grinder. This leaves the user's other hand free to remove the collet nut. The feel of using an Allen key instead of a blade wrench is odd at first, but after a few tries the disk come off without any trouble or slowdown. Not having to worry about losing a special purpose wrench is a big plus. 7 amps and 12,000 rpm are an interesting combination. At the instant the disk touches the work piece the DWE4011 cuts as fast as the best 4 1/2" grinders on the market. As the disk digs in the relatively weak motor struggles to keep it spinning. On tough tasks like grinding concrete the motor can outright seize. The solution to this problem is letting the DWE4011 work at its own pace. It'll cut through angle iron without a hitch, if you reduce the feed rate just a little from what you are used to from premier grinders. If the work is done in a few minutes, you'll never notice the few extra seconds the DWE4011 takes to get the job done. On large projects, on the other hand, the DWE4011's lack of power turns into a glaring fault. The grinder won't let you work at the speed you like, unless you risk burning out the motor. After a few minutes of work, you'll want chuck the DWE4011 and get a more powerful grinder. While the built quality of this grinder may be good overall, on the job site the lack of dust protection shortens its life dramatically. The DWE4011 will last longer as a metal working tool than as a concrete cutting one. The DWE4011 is a well built, but under-powered grinder. On small projects you'll never notice the missing top-end power, but on large ones this grinder will hold you back. Despite the DeWalt name, the DWE4011 is only good for tasks that are measured in minutes. If you try to do more with this grinder, it'll either slow you down, or wear out prematurely. Light to medium duty users can save a lot, if they purchase the DWE4011 with clear intentions. 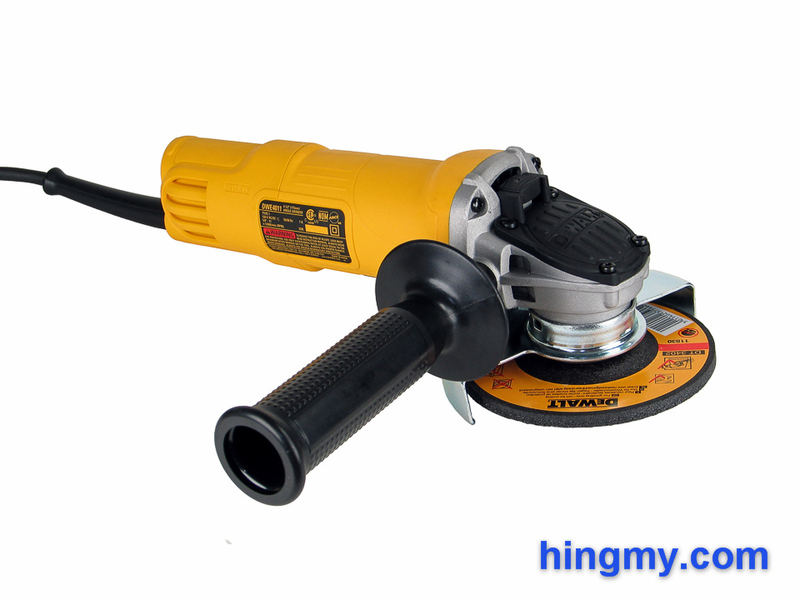 Hobbyists and homeowners can buy the DWE4011 grinder without hesitation. Professionals need to look for a more powerful grinder.